Take your sweet shop up a notch when you add topping displays for bulk dry food dispensers for delicious edible materials such as candy, sprinkles, nuts, raisins and more. Not only portion control the amount dispersed, but our displays add a little finesse to your store. For a kid, the most exciting part of the yogurt shop is all the glorious toppings. Kids love to decorate their frozen treats with dry items like candy, cookie crumbles, and more. 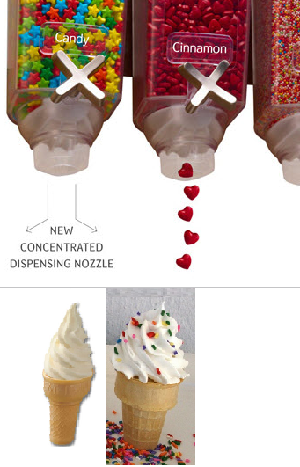 However, if you imagine all the little hands reaching for those crushed candy toppings, you will quickly realize the benefits of having one of these food topping dispensers. Without the proper container, toppings will scatter quickly and turn your shop into a mess. The best way to showcase various garnishes is with one of our wall mounts or a counter display dispenser. These dispensers are a great way to preserve the freshness of your product, keep the mess under control better as well as save on merchandise loss. Most of these topping bins have portion control capabilities which further ensure that toppings aren't wasted. Wall mounted topping dispensers provide more open space by taking advantage of wall space to store bulk toppings. In addition to keeping products fresh and waste down, candy dispensers are also a wonderful way to add some colorful "art" to your counters and walls. Picture a whole wall covered in wall-mounted topping dispensers. These containers allow customers to think about their options from afar. These dispensers may cost more initially than bins, but in the long run they are a money savers. If a wall full of these ideal candy bin displays are unreachable right now, start small and build your inventory along with your customer base. Keep your sweet treat extras organized and allowing your customer's easy access to the toppings bar. Allow your display to sell itself. Place your purchase today and conserve your cash today!